Unfortunately for me, that means I'm facing a weekend jam-packed with studying for biostatistics and physics midterms. I do get to see my family on Sunday, so there's a light at the end of the tunnel! Blog posts will likely be relatively sporadic until next Wednesday because I'm quite literally drowning in coursework. Apologies in advance! I did want to make a quick blog post today discussing my collection of the NARS Satin and Velvet Matte Lip Pencils, as I've recently rediscovered my love for them. All of the NARS lip pencils I have are travel-size. I'm quite fond of travel-size lip sets as they give me the opportunity to try out many different shades, formulas, and even brands of all sorts of lip goodies. NARS released a fabulous set for the 2014 holiday season called NARS Digital World Lip Pencil Set that my family generously gifted me. This set contained lip pencils in the shades Descanso, Torres del Paine, Iberico, Yu, and Cruella. I was immediately attracted to this set due to its wide shade range. I know this may be intimidating for some people, but I personally find it empowering to see that I can rock any lipstick shade I damn well please! I also have travel-size versions of the lip pencils in Cruella (again) and Rikugien. If I remember correctly, these were the 2015 birthday gift from Sephora. Descanso, Torres Del Paine, Yu, and Rikugien are from the Satin Lip Pencil line, while Cruella and Iberico are from the Velvet Matte Lip Pencil line. The Satin Lip Pencils tend to be a bit sheer and are lightly moisturizing. They act as more of a lip balm/stain than a lipstick, so I enjoy wearing them on days where my lips need some hydration. They're not incredibly long-lasting but are quite easy to reapply. I absolutely love the formula of the Velvet Matte Lip Pencils. These lip pencils are a bit waxy, which do make them have a sort of velvet texture as the name implies. They have a matte finish and are a bit drying, but they're nowhere near as bad as most liquid lipsticks are. I'd say they last about 6 hours on me and they definitely need to be reapplied after eating. They do have a tendency to feather, so I make sure to wear clear lipliner if I don't want to be touching that up all day! All of the Lip Pencils apply as the name suggests - they are shaped like a pencil rather than a lipstick and do not have a doefoot applicator. They are easy to cleanly apply when the product is "sharpened", but once you get down to the bottom the pencil flattens and makes for messier application. The packaging itself is simple, sleek, and matte which are three qualities that attract me to a product. The only real issue with the packaging is that you'll need a sharpener with a wide hole, as these lip pencils have a larger diameter than the typical makeup pencil sharpener is equipped to handle. Cruella: This is a scarlet, medium red shade with cool undertones. It truly does give serious off Cruella Deville vibes. This is my absolute favorite shade so I'm happy I have two of them to use up! Yu: This is a bright Barbie pink that has cool undertones. I have a hard time pulling off bold pinks that are warm-toned, so this cool-toned shade is actually super wearable for me. It's a great shade to wear with a smokey eye for a girls' night out. It definitely stains my lips for quite some time though, so beware of that! Rikugien: This is my favorite out of the three neutral shades in my collection. It is a gorgeous dusty rose shade that brings just a bit of color to my lips on days I don't want to go super bold. It's perfect for those days when you're going for a soft look. Descanso: This is my "My Lips But Better" shade. It is a neutral soft peachy pink that I think would look flattering on a variety of skin tones. Unfortunately, this shade is also MIA on the internet, so I think this has also been discontinued :(. It looks like the NARS shade "Isola Bella" is likely a dupe! Torres del Paine: This is a coral shade that is actually quite soft and wearable. It pulls a bit more orange than Descanso does. Since we all know I'm afraid of the color orange based on my review of Iberico, I don't reach for this shade all that often. But after swatching it for this post I've realized how beautiful it is, so I think I'll reach for it more! This shade also appears to be discontinued, but the NARS shade "Lodhi" appears to be pretty similar (but perhaps for pink-toned). You can purchase the NARS Satin Lip Pencils for $24 and the NARS Velvet Matte Lip Pencils for $26 from Sephora. I will very likely repurchase Cruella when I run out of the two sample-size pencils I have in that shade. Although they are pricey, I adore the formula of the Velvet Matte Lip Pencils in particular, so I would be willing to splurge on a couple of shades for myself. I'm dying to get my hands on the shades "Train Bleu", "Damned", and "Dolce Vita" from the Velvet Matte line, so perhaps those will be in my future! 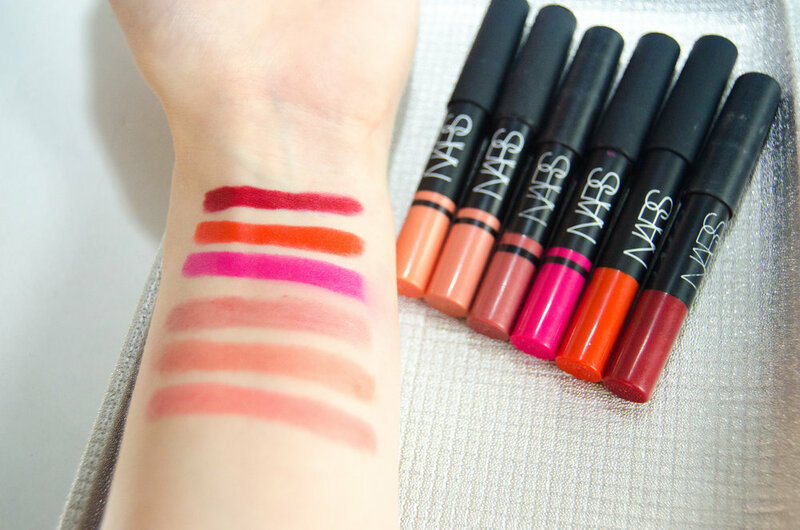 Which NARS Lip Pencil line do you prefer - Satin or Velvet Matte? What are your favorite shades? Leave a comment below with your faves!